In These Times 24/04-5: Uncle Tom's Cabinet? It is a sad, ironic testimony to the current complexities of racial politics in America that African-Americans like Colin Powell and Condeleeza Rice can attain unprecedented career advances in tandem with the sweeping disenfranchisement of thousands of black voters. The Bush victory enabled these two loyal Bush family (White) house servants to become some of the most powerful blacks in the nation at the expense of the rights of black voters and the ratification of the theft by the Supreme Court. Now it appears the constitutional mandate of equal protection requires that the rights of some voters (guess who?) be ignored in order to protect the rights of others. document outrageous instances of voter disenfranchisement. Haitians were denied translators to help them decipher confusing ballots. Roadblocks turned prospective voters away from access roads to the polls. Black men were singled out for criminal background checks as they headed to polling stations. This is all in addition to the highly publicized chicanery and technological "glitches" that excluded some 185,000 Florida ballots, in an election in which record numbers of African-Americans voted (and many more tried). However, some of the most deep-seated aspects of black disenfranchisement in the state are structural and predate the recent election debacle. Some 400,000 black men in Florida are permanently barred from voting because of a 19th century law disenfranchising those with a felony conviction. This 1868 law dates back to after passage of the 15th Amendment, which gave black men the franchise. A century later the targets are the same, and the law is working the way it was intended. 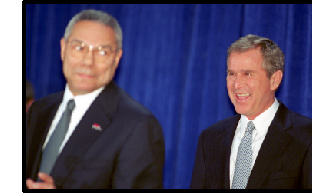 Given the flagrant racism that permeated the election and its aftermath, it was a strategic move when, just days after Gore's concession, a smiling Dubya proudly announced his diverse senior nominees, nudging first Rice (for national security adviser) and then Powell (for secretary of state) before the cameras to sing his praises. Even before the Supreme Court handed victory to Bush, he had indicated that these two would be some of his first appointments. This is no coincidence; it is another example of what the Republicans really mean by "colorblindness." Colorblindness means that we should all pretend that race played no role in selecting high-ranking black people to speak for a regime whose commitments to racial justice are seriously suspect at best. Consistent with this strategy, on December 20 Bush met with a national group of religious leaders, a third of them African-American, to further deflect attention away from the persistent and persuasive allegations of racism. Eugene Rivers, a Boston-based minister who describes himself as an independent, emerged from that meeting to criticize Jesse Jackson for challenging the fairness of the election. Although trying to authenticate more conservative blacks to speak for the race is old news, the choices of Powell and Rice do represent a shift in the way in which racism manifests itself. These nominations would have been inconceivable a generation ago. But the black community has changed, and the face of racism has too. There is a greater tolerance of phenotype diversity, as long as there is conformity in terms of ideology and loyalty. Indeed, such symbolic integration at the top can be valuable as long as the black symbols remain faithful promoters of the party line. For example, while Powell differs with Bush on affirmative action, which the general benefited from, he is obviously still willing to be a team player to advance his own career interests. This is Bush's version of affirmative action--or "affirmative access," as he calls it--brown faces at the top as long as they go along with the silencing of black sentiments at the bottom. The pioneer for this new style racism was Supreme Court Justice Clarence Thomas, one of the strongest supporters of the conservative opinion in the Florida decision. What all three of these black conservatives show us is the limits of representation at the top. Despite their backgrounds, they have conveniently forgotten the struggles from which they benefited. Thomas was the product of impoverished southern farmers. Powell came from a working-class immigrant family. And Rice, born the year of the Brown v. Board of Education decision, was a classmate of one of the children killed in the 16th Street Baptist Church bombing in Birmingham, Alabama by white vigilantes. Yet all three have twisted and reconfigured those experiences to justify current positions that would ignore the brutal forms of discrimination and oppression facing the masses of black folk without access to the privileges and power that they now enjoy. In the end, neither Clarence Thomas, Colin Powell nor Condoleeza Rice can disguise the sentiments of the overwhelming majority of African-Americans. Ninety percent of the black electorate voted against George Bush in this election. They did so with good reason, given that his policy objectives portend even deeper retrenchment in the areas of civil rights enforcement, economic justice and other areas of concern to black communities all over the country. "If Bush intends to hold out a conciliatory hand to the black community," says Fran Beal, a civil rights activist and leader of the Black Radical Congress, "he needs to first condemn the blatant disenfranchisement of tens of thousands of black and Haitian people and rigorously move to enforce the Voting Rights Act of 1965." The Republicans hoped to dampen the outrage of African-Americans with jobs for black elites and Booker T. Washington-type access to uncritical African-American leaders. But folk won't be fooled so easily. Barbara Ransby is an assistant professor of African-American Studies and History at University of Illinois, Chicago. Cheryl I. Harris is a professor of law at the University of California, Los Angeles.